I got my wish. 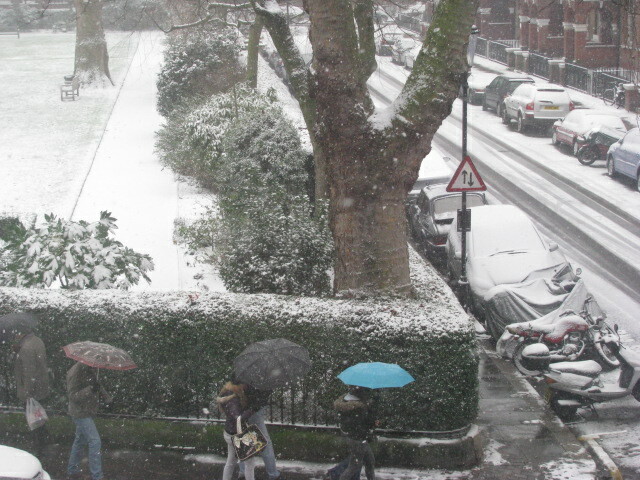 It snowed in London. Actually it snowed off and on all weekend. There wasn’t a lot of accumulation, but I won’t complain. So what did I do? I stayed in, curled up on the couch, and read. Not a bad way to spend a weekend. 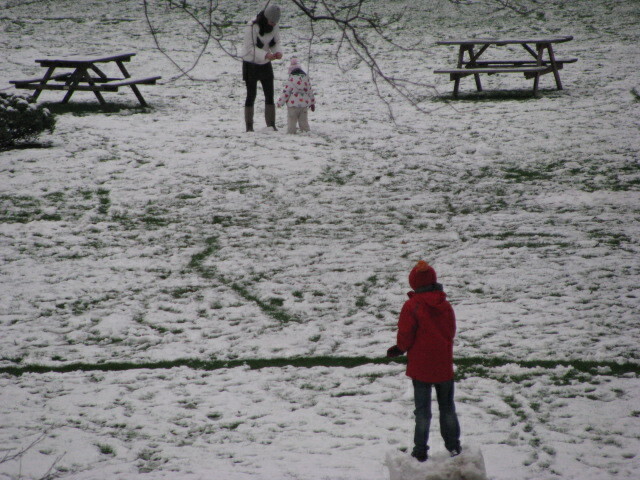 And the winter scenes from my flat were lovely. One of the books I read was Candide by Voltaire. This was not my first reading of the novel. Nor was it my second. To be honest, I don’t know how many times I’ve read this short work. I know I had to read it in school at least once. Then, when I was a graduate assistant I read it each year (total of two years) to discuss it with my students. For my 1001 challenge, I have to read or reread all of the books on the list in order to complete the challenge. Rereading this satirical novella was a joy. It’s one of those books that doesn’t get tiresome. In fact, each time I appreciate it more. Maybe that’s because each year I experience a little bit more of life and can relate more. Each pages oozes with sarcasm and Voltaire moves the plot along quickly. The fast pace, humor, and outrageous stories make this a memorable story. When it was published, 1759, it was banned in many areas for its religious and political views. Over the years, readers have come to love his wit and commentary about his society and human nature. Today, it’s considered a classic and one of the most read French novels. This work has influenced many modern writers, including Joseph Heller, Kurt Vonnegut, and Thomas Pynchon. It you have not read it and you like satires I would highly recommend Candide. This novel is on my 1001 list and it’s the first novel I’ve read in 2013 for my challenge to read more novels from around the world. Voltaire was a French Enlightenment writer born in 1694. He died at the age of 83. Below you will find some photos from this past weekend. Miles loves to play the kick snow in my face so I can eat it game. He never tires of it and I usually have to drag him back inside so he won’t freeze. In this photo he’s angry since I’m not kicking the snow fast enough. This entry was posted in Books and tagged 1001 Books you Must Read Before you Die, 50 Year Project, Blog, Blogging, Book Reviews, Books, Candide, England, French Writers, Lady Cunegonde, Life, London, Novels, Photography, Photos, Satire, Satirical Novels, Snow, Snow Weekend. Snow in London, Voltaire. Bookmark the permalink. I bought the book ages ago when I had my must-read-all-classic-literature-of-the-western-world phase, but have not yet done so. I should. I will. The snow looks lovely. We have a lot more, and my dog loves eating snow as well – especially any that I’m trying to scoop up, which makes any attempt at making snowballs a contest in which of us is faster. Why do dogs love to eat snow? Miles will actually eat it until he pukes. Then he’s ready to eat more. Good luck in the snowball war. I understand the difficulty, trust me. And I hope you do read Candide eventually. It’s good! I have read Candide a couple of times myself and your post is now prompting me to do so again – I know I’ll enjoy it! Nice to meet another fan. I recommend this book all of the time. It’s short, fun, and witty–hard to go wrong. Hope you enjoy your reread. A little warmer today, but this weekend was freezing. Hence why I stayed inside. I would love to see a video of your dog eating the snow! I’ll have to work on the video thing. None of my devices actually do it. And yes, the snow is a nice change of pace. Love, love the snow!! Your dog is so cute. He looks like he is waiting for more snow to come his way!! I have not read the book. Sounds intriguing. He’s always waiting for more snow to come his way. We just got back from a walk and he’s covered in snow, but he’s happy. I am missing Candide by Voltaire. The snow looks cold. You’re almost the only other perosn I know who has not only read Candide more than twice but like me likes it a lot. I hear so often that people hate it, think it’s to dry, too this, too that. It really isn’t. It’s genius. Why do dogs love to eat snow? Mine used to, couldn’t get enough of it. We had quite high snow, even our balcon was torally covered and the cats had their first snow experience ever. Can’t say they were thrilled. Shocked comes closer. And no eating involved. I think some people may miss the sarcasm of the novel, however, I don’t understand how some can say it’s dry. So much is going on all of the time. And yes, the novel is brilliant. each time I read it, I pick up on something new. I bet it was entertaining to have dinner with Voltaire–I’m not sure I could have kept up with his witty banter, but I would have loved to observed him converse with his friends. Atticus hates the snow. He will tap it with his paw and then shakes it immediately like he just stepped into a fire. Then he looks at me like it’s my fault. Now he won’t even venture out on the balcony if there is any trace of snow or rain. i’ve read candide a couple of times, but the last time was years ago. i gave my oldest some of my books when he moved out, and this is one he took. it is online, though, so not having a hard copy can’t be an excuse for me for not reading it again. it’s nice to re-visit books. looking at miles’ face makes me think it’d be hard not to give him what he wants. 🙂 we haven’t gotten any snow so far this winter except for a few flakes. it’s still not too late, though. Miles has learned that if he flashes me his smile he gets what he wants. And if I happen to stay strong, then he barks his head off to wear me down. I can never win. I hope you get the snow you want, without all the hassle. This storm was nice since it was pretty but I didn’t’ have to shovel or scrape any cars and such. I was able to stay in and enjoy the scene outside. Love Miles’s orange coat. 🙂 He looks like he’s just waiting for you to come closer so he can kick the snow on you. Glad that he got a chance to play in the snow. We haven’t had any here this winter, though we’re expecting some later today, but we’ll see. I haven’t read Candide in years. I think I’ll put this on my list to re-read (right after Gatsby). A friend of mine is trying to make a contemporary movie loosely based on Candide (like O Brother Where Art Thou and the Odyssey). Should be interesting! That does sound like an interesting story. Will this movie be released for all to see. I would love to see the final product? And I love The Great Gatsby. One of my favorite books of all time. Enjoy! I love this book. In French, we have a special category for stories like this: conte philosophique. Thanks for the link Emma. I’ll pop over and read it. I like when people leave me a link–what can I say, I can be lazy. I read Candide at Uni and I enjoyed it, too. I wonder if everyone reads it at uni–that’s where I first discovered it. However, I was taking a history class on the French Enlightenment. Hard to study that period without reading this work. Ha ha lol great post i did one simular totis one! Haven’t read Candide since college, but thought it was brilliant. I am amazed that you are rereading books for your challenge! Rocky hates snow, so he’s very happy to be back in Cali. It looks like you may have cold weather for a while. Stay warm. I don’t think the cold is going away anytime soon. But it makes spring more enjoyable when it arrives. Poor Rocky, I’m glad he’s back in his element. It would be nice to be a California dog. I read this when I studied French at A level. I don’t think I have ever reread it, but much of it has stayed with me. For my French class we read the Little Prince–much easier, I think, to translate. I would love to read this in the original language. So you’re the one who wished up the snow! It always looks so lovely at first doesn’t it! 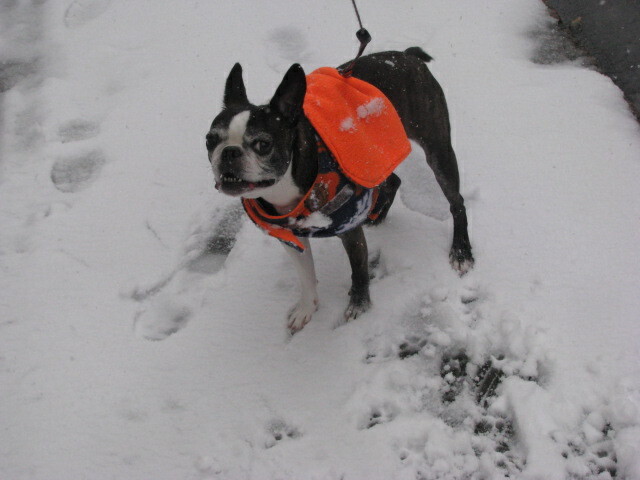 I took my dogs out tonight – it was snowing again. It really did look quite beautiful. Dark night. Lights picking out the snow as it drifted slowly down …. but it gets on my nerves. The first five minutes are a novelty! Then it’s just a total nuisance and I turn into the biggest grump in the UK! I was wondering if the dogs feet were cold! It’s strange isn’t it the random thoughts that go through your mind sometimes! I worry about Miles’s feet as well. It doesn’t seem to bother him. I’ve seen dogs with shoes are, but I’m not sure Miles would put up with that. He battles me about his jacket even though he barely has any hair and shivers on summer nights. I heard last night was the last of the snow for a little bit. Now comes the rain.